With the right plan, you can enhance people’s social media experience and generate more sales. 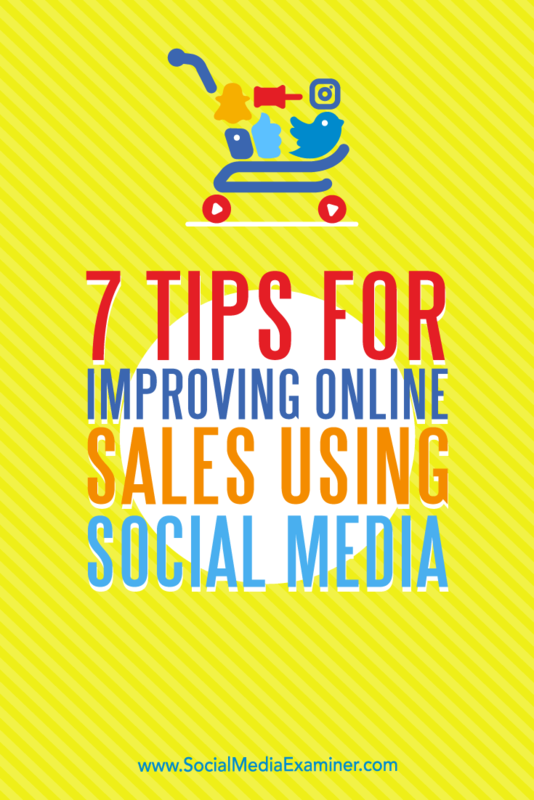 In this article, you’ll discover seven tips to improve your ecommerce using social media. 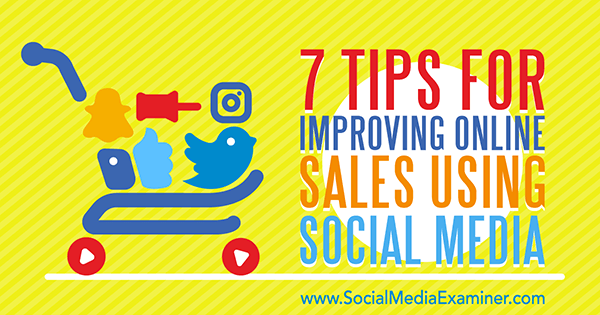 7 Tips for Improving Online Sales Using Social Media by Aaron Orendorff on Social Media Examiner. Native chatting (or “conversational ecommerce”) is using the messaging services within each social network to automate, customize, and personalize your communication. With higher retention and engagement rates, these apps have quickly become the go-to choices for customers who want to connect more directly with businesses. In other words, if you’re not using chat apps to automate confirmations (and yes, even to sell), you’re missing a huge social ecommerce opportunity. However, approach automated chat apps (like Facebook Messenger Bots) with caution. It’s too easy to cross over from the human to the inhuman side of conversational commerce. For instance, using native chat for blatant marketing (as if it’s the newest and coolest email list) is a huge no-no. Likewise, so is relying on it to automate front-end sales. Don’t rely on native chat to automate the sales process. But used by humans for humans, the benefits can be massive. Take Bontact, for example. It’s a multi-channel, real-time support service that allows you to manage native chatting on any network or device. Being able to respond to questions and problems natively (meaning within the natural channels your customers already communicate on) helps you provide better customer service, increase customer retention, and build a positive brand image. 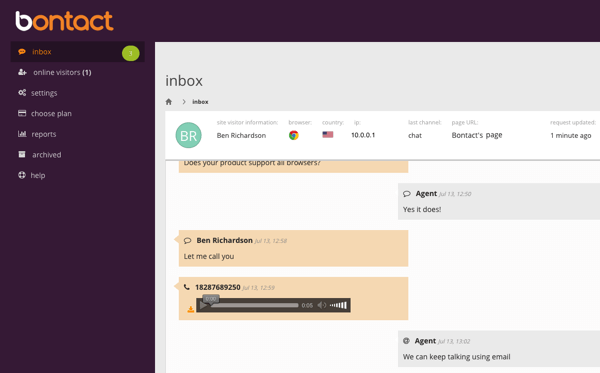 Bontact’s dashboard lets you manage all user conversations from a single place. This helps you tailor assistance (and even move toward upselling and cross-selling) based on consumer history. Social media is a goldmine for listening to and participating in customer conversations. However, the constant onslaught makes it difficult to identify the information that really matters. Brand listening is the art of deriving valuable insights by observing, compiling, and analyzing conversations about your brand, industry, and competitors. Keeping a finger on the pulse of your online audience helps you salvage tricky situations, reward brand advocates, generate new leads, mine creative marketing techniques, identify customer pain points, track sentiments, and gauge motivations. On top of that, the keenest companies track their competition, too, ready to swoop in and help any dissatisfied customers. All of this requires you to go beyond monitoring your official social media mentions. That’s where Talkwalker comes in. It’s a social media analytics and reporting platform that will examine both text and visual content. The social listening functionality taps into the complete spectrum of conversations across 150 million websites, social networks, print outlets, and media broadcasts. 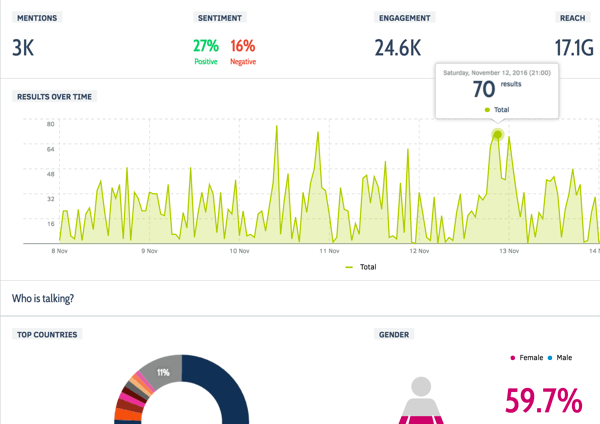 The tool’s analytics will benchmark your performance against competitors, pinpoint conversational themes, trace viral hashtags, and identify relevant influencers. Monitoring your explicit brand mentions on social only tells you half of the story. Talkwalker pulls in comprehensive data, even when you’re not tagged. Success on social media depends less on how much you talk about yourself and more on how much your customers talk about you. Similar to UGC, purchase-process sharing means encouraging consumers to share their favorite items before, during, and after a purchase. As evidence, nearly 1 in 3 Facebook users has made a purchase after “sharing, favoriting, or commenting” on the product themselves. AddShoppers is an on-site ecommerce platform that makes word-of-mouth marketing easy via incentivized purchase-sharing techniques like social rewards and refer-a-friend campaigns. You can leverage customer satisfaction to interact with audiences you otherwise might have missed or ignored, and strike while the (ecommerce) iron is hot. 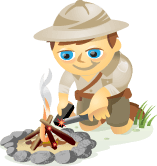 Incentivize purchase-process sharing using AddShoppers. Your customers are far better salespeople than you’ll ever be. Social-driven retail sales are growing at a faster rate than all other online channels, and buy buttons play a starring role in this growth. Buy buttons let users make seamless and secure purchases from within social networks themselves. They reduce what’s normally a multi-step process to a single click. Let’s look at two options. In June 2014, Facebook unveiled their first buy button to the public. 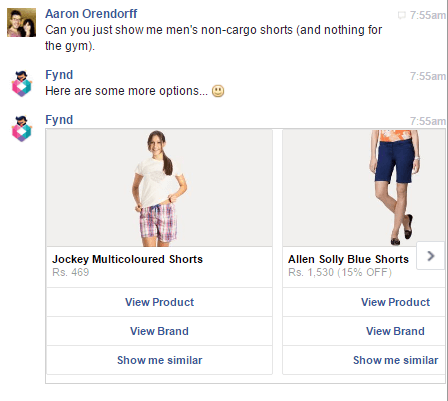 This September, they launched a buy button for Messenger. If you host a Facebook store, you can showcase your best products, hold special Facebook sales events, display exclusive merchandise, and have a dialogue with customers. Whether on your fan page, in your Facebook store, through paid ads, or even in Messenger itself, Facebook offers a host of direct buying options. Pinterest rolled out buyable pins in mid-2015 to a select group of retailers, and now the option is available to everyone. The extended shelf life of pins, the enormous reach of repins, and the appealing aesthetics positioned Pinterest as a powerhouse of social ecommerce. A mixture of “aspirational and actionable” pins will stimulate purchases, increase product reach, and maximize revenue. User-generated content (UGC) is content created and shared by your fans, followers, and customers on social platforms, either spontaneously or through contests or giveaways. Does curating UGC work for ecommerce? Absolutely. According to Business Insider, consumers who come across UGC are 97% more likely to convert than those who don’t. User-generated images (images created by customers featuring your products) are especially powerful. In fact, when online shoppers were asked to choose between UGC (like people post to Instagram) and professional images on product description pages, the overwhelming preference was for Instagram photos: 77% to 22%. Those kinds of findings are why Yotpo created their social curation tool for Instagram. Using authentic visuals will demonstrate social proof, drive high-intent users from Instagram to product pages, increase on-site conversions, and improve ad performance. 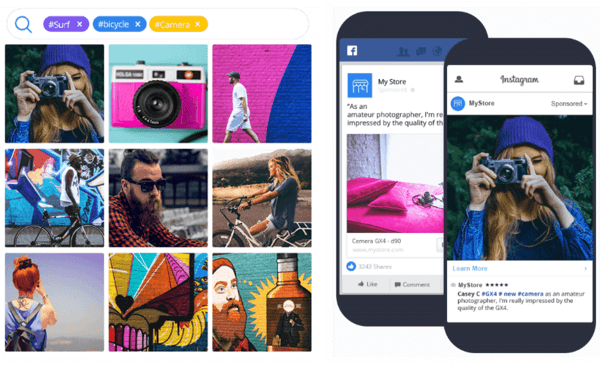 Yotpo lets you collect, curate, tag, and feature Instagram photos on social and your ecommerce site. Nearly all ecommerce businesses operate on a seasonal calendar, and for the most part, they do a great job of creating sales, discounts, emails, and incentives. They’re also outstanding at stocking their social streams with announcements about all of those seasonal ecommerce activities. 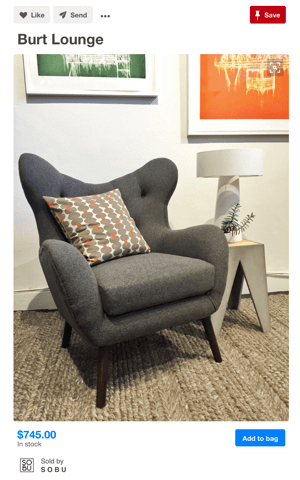 Where most stores fall short, however, is with creating seasonal content that isn’t overtly promotional. Why is that a bad thing? Because dominating your seasonal activity with one pitch after another comes off as thoroughly disingenuous … and even antisocial. The answer is to get organized with a social content-creation platform like PromoRepublic. 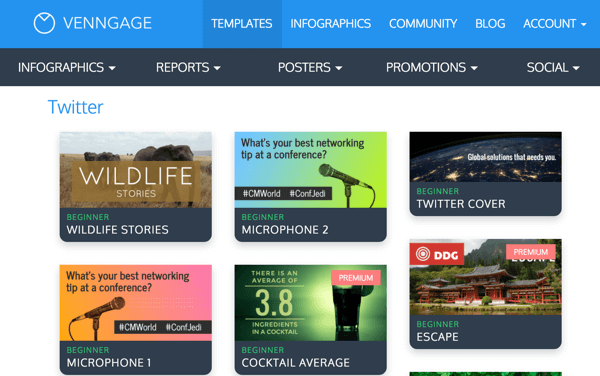 With a library of thousands of seasonal, topical, and thematic templates (including celebrations as specific as Hugh Laurie’s and other celebrities’ birthdays), PromoRepublic makes it easy to craft genuinely social posts related to the events your audience cares about. 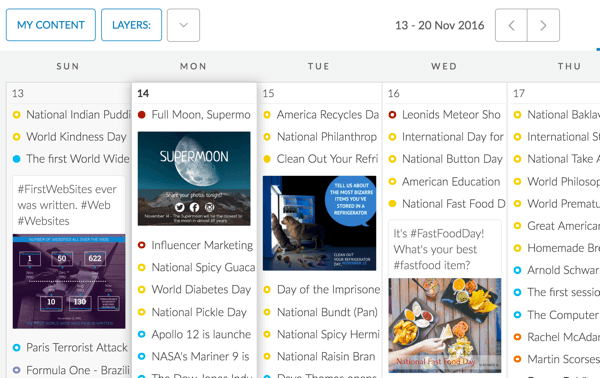 Plus, the content calendar lets you load and schedule those date-sensitive posts. With PromoRepublic, you can create seasonal, topical, and event-related updates without being too salesy. You’d be hard-pressed to find any kind of social content without visuals. As users get more discerning, however, they’re shunning generic stock images. A Chute Digiday study on the state of visual marketing determined that more than 70% of respondents find images at least twice as effective as text content alone. The problem is what do you do if you’re not a designer and can’t afford to hire one? Two tools stand out. For true-to-life photos, Buffer’s Pablo lets you select from over 600,000 royalty-free photos and/or upload your own, which is perfect for product pictures. 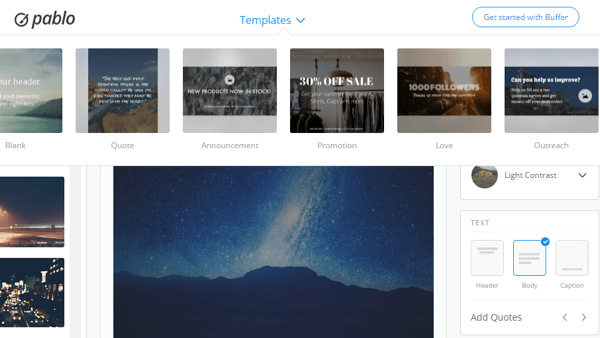 Choose from network-specific image templates, 10 filters, 6 use-case templates, and 3 font arrangements: headline, body, and caption. No registration is required. Add text to high-quality and royalty-free images using Pablo. Plus, automatically create images sized correctly for each social network. For graphics and infographics, Venngage offers hundreds of templates to quickly create detailed visuals even if you have no design skills. The templates are categorized into Beginner, Intermediate, and Advanced to accommodate your level of expertise and experience with the product. Design shareable social media graphics or infographics with Venngage (even if you’re not a designer yourself). Do the words “social selling” conjure up sleazy images of unsolicited and heavy-handed pitches instead of conversations, the very thing social media is supposed to be about? Ads on social media are far from ineffective, but if they’re the only tactic you rely on, the odds of your ecommerce business coming off as decidedly antisocial are high. Instead, it’s vital to add in one or more of these seven “musts” to your ecommerce social media mix. What do you think? Do you use some of these social media tactics to enhance your sales process? What tips can you offer? Please share your thoughts in the comments below.